Ok ok…hold on to your seats and stay with me. I know you’re asking yourself either of 2 questions. 2) And why the heck is it savory? 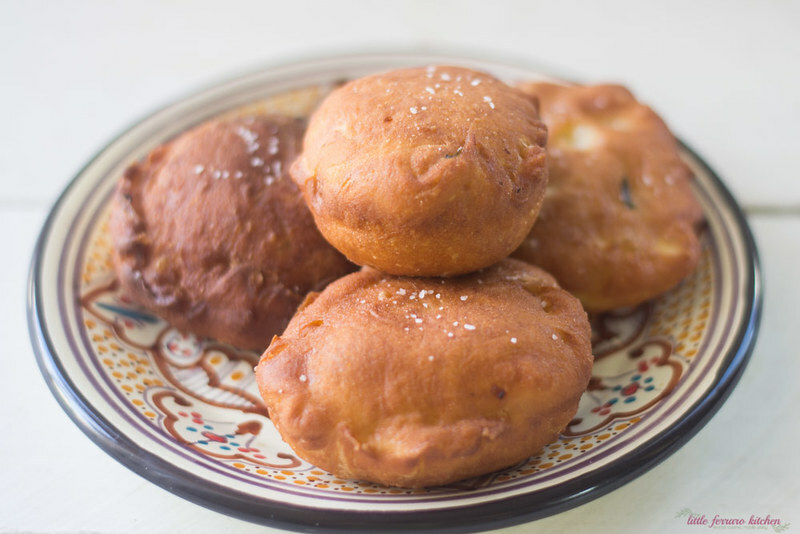 It’s Hanukkah season = all things fried! We fry just about everything and anything during these coming weeks! Of course latkes get all the attention, which are great, latkes are awesome…more fried potatoes..yes please! But it’s sufganiyot that are actually more popular in Israel..aka the Jew donut, but not really..it’s really a jelly filled donut! Now if you know me well, you know I always try to savory-ify anything and everything. My salty tooth is much stronger than my sweet tooth and I’ll down some salty potatoes over a sweet donut any day..but what if we tried to saltify the donut? Stuff it with freshly sauteed veggies, sharp feta cheese instead of the overly sweet, jelly filling? Well….I present to you…the savory sufganiyot! I must say, I am pretty proud of the plumpness that I created. 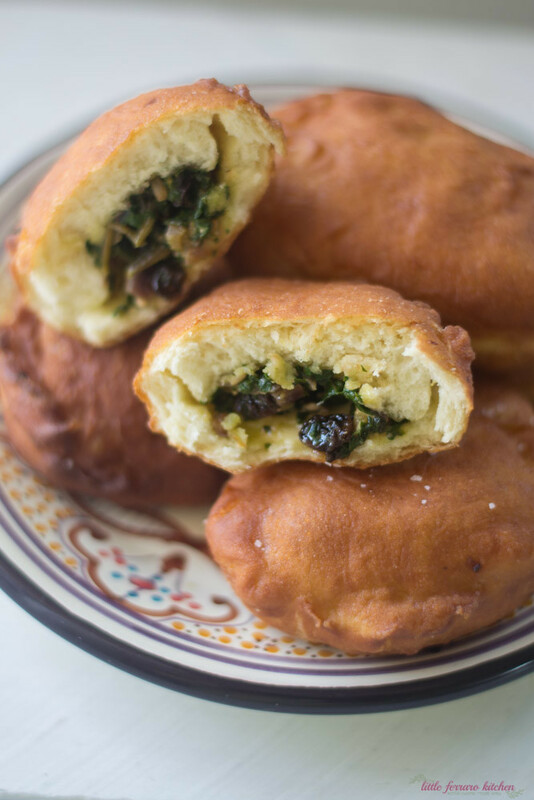 The perfectly light and airy, savory sufganiyot, with small air pockets inside, perfectly fried on the outside. Not too heavy and easy enough to down a few (I won’t tell if you won’t), but the filling is what really takes the cake. Or the donut…or the sufganiyot. This inspiration wouldn’t have been as amazing without the thanks to Cut N Clean greens. I absolutely LOVE their products and have used them in numerous recipes…Kale and soba salad, winter sweet potato salad and one of my most recent creations…kale falafel! (You know, just to give you few ideas if you’re over frying). And here I am again, frying greens! Will it ever stop?? No, no I don’t think so. I still have 2 weeks until Hanukkah ends, so brace yo’ self. 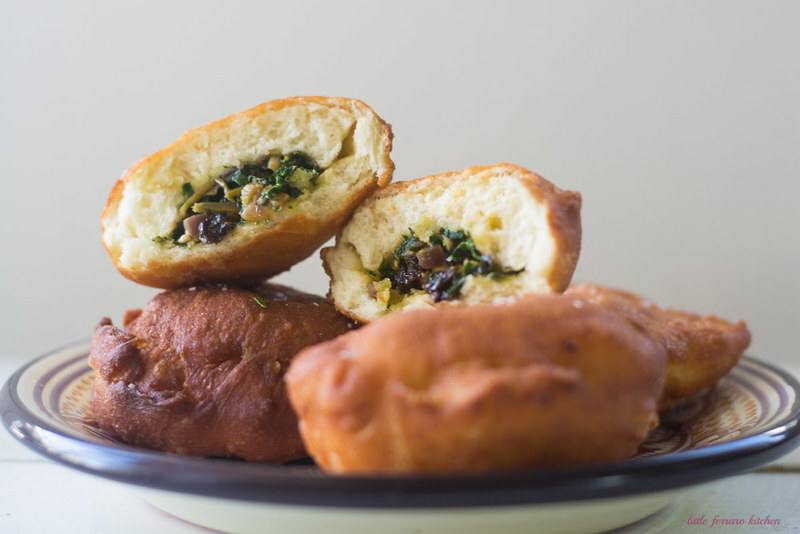 For this recipe, I decided to stuff my savory sufganiyot with rainbow chard, raisins and feta. A very popular Sephardic pairing, with the sweet sand savory. I used Cut N Clean green’s Organic Rainbow Chard with it’s gorgeous bitterness. The chard is already prepped and washed and ready for sauteing, but for this recipe, I opted to chop it just a bit more to fit into the donut better. 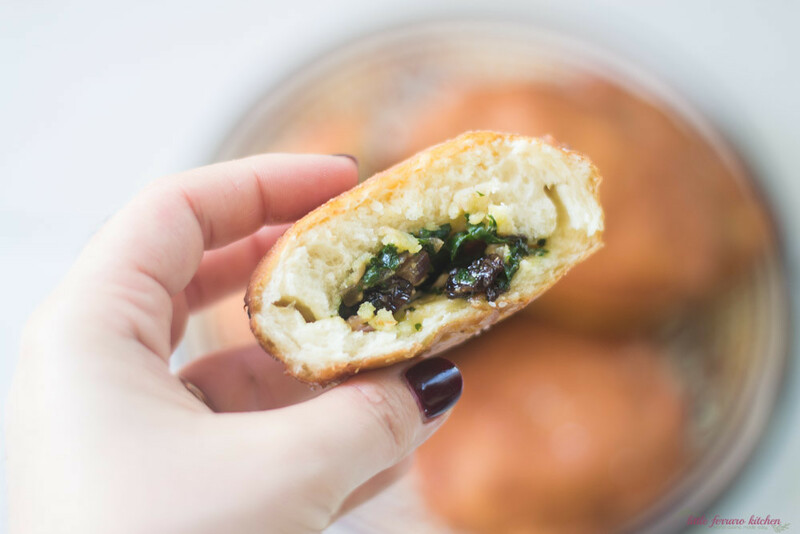 And for your frying pleasure…step by step on how I created savory sufganiyot. Are you in for this savory Hanukkah treat? 1) First, make the dough. 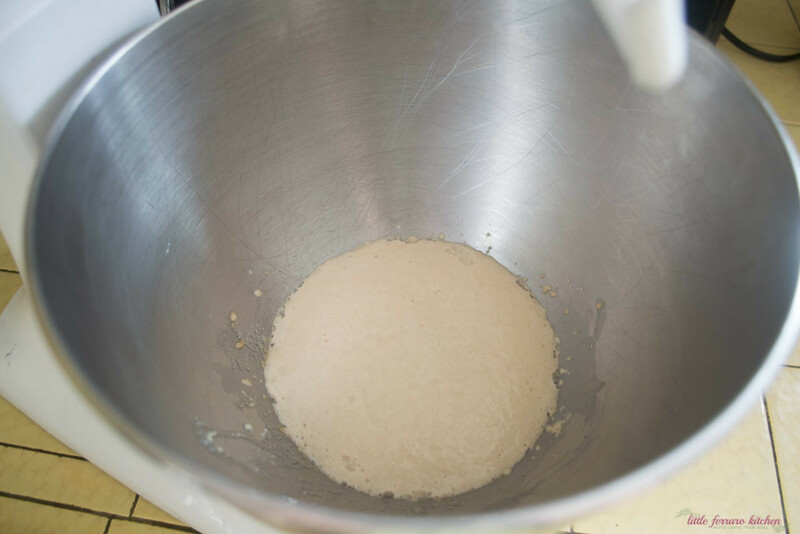 In the bowl of a stand mixer, add yeast, sugar and warm water. Mix with a fork to get all the yeast in the water and allow to sit for about 15 minutes until it gets all foamy and bubbly. That’s when you know the yeast is activated. 2) Next, in another bowl, sift together the flour and salt. Add eggs, lemon zest and gently mix the eggs into the flour. 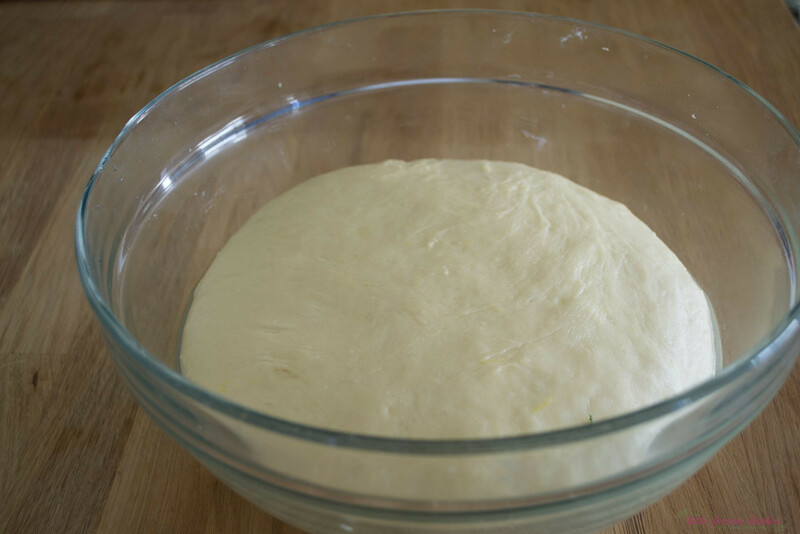 3) Add the flour and egg mixture to the yeast and use a dough hook to begin mixing everything together. You may have to use a spatula to push flour into the mixture, so check. Continue mixing for a few minutes until the dough comes together and starts to look smooth and forms a ball. Next, add butter, a few tablespoons at a time. If it’s too sticky, add some more flour, up to 1/4 cup. It should look mostly smooth. 4) At this point, I like to knead the dough my hand to see how it feels. Turn the dough on a lightly floured surface and knead by hand for a few minutes. I wound up adding 1/4 cup more of flour, slowly until it looked smooth and slightly sticky. When done, form the dough into a ball and place in a lightly oiled bowl. Cover with a towel and place in a warm spot to double in volume. 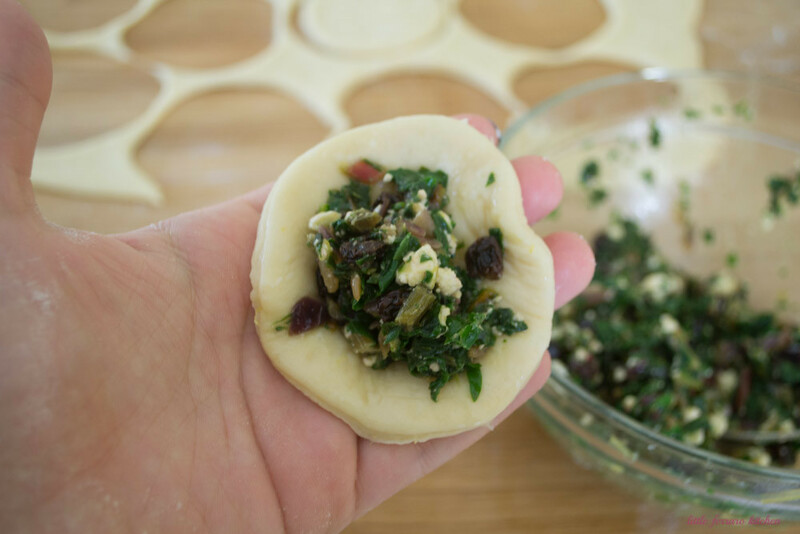 5) While dough is rising, make the filling. Drizzle a bit of olive oil in a skillet and on medium heat saute onion until lightly browned, about 5-8 minutes. 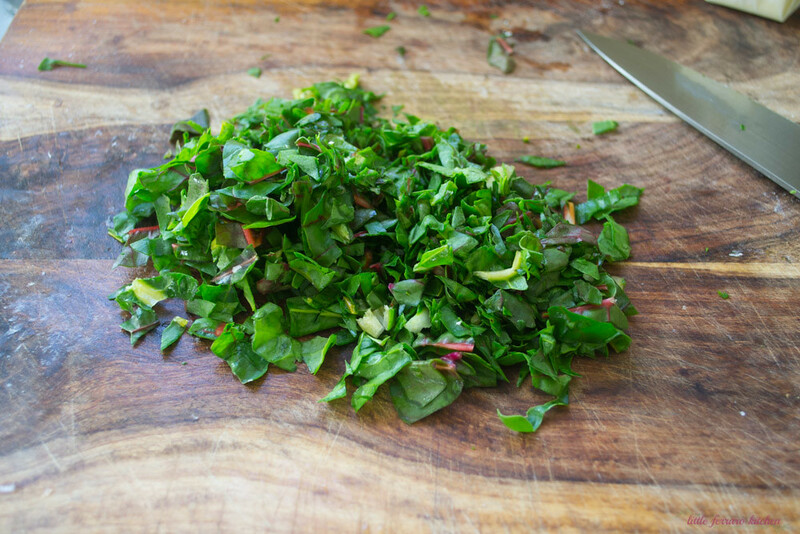 Then chop the Cut ‘N Clean Greens Organic Rainbow Chard into fine pieces and remove any large, hard stems. Add chopped chard and saute until wilted. Add raisins and season with salt and pepper. Saute for another minute until raisins plump up. Reserve to a bowl and add crumbled feta and toss to combine. 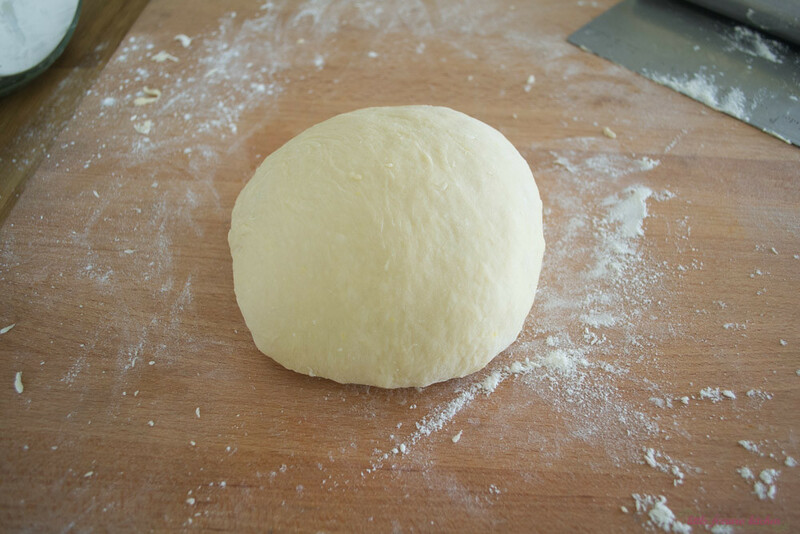 6) Now check on the dough and once it’s doubled in volume, punch it down and turn it onto a lightly floured surface. It will feel a bit oily and that’s ok. 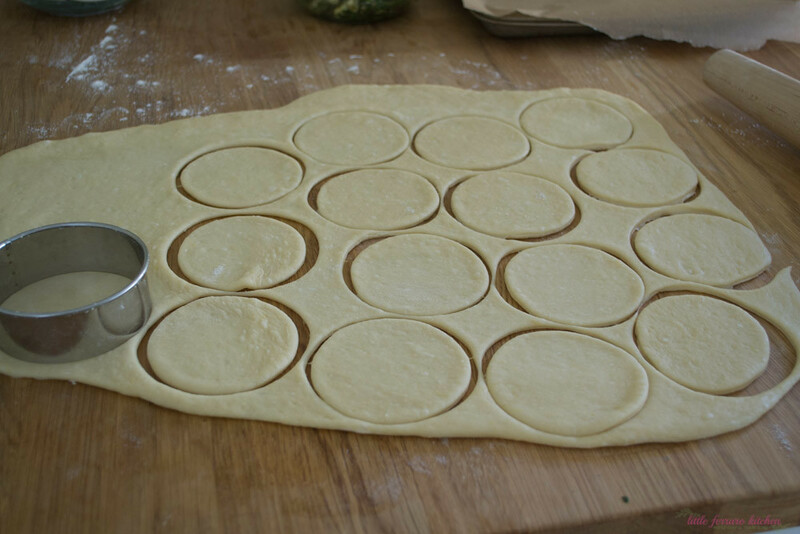 Roll it out to 1/4 inch thickness and use a round 2 inch cookie cutter and cut circles (or any glass will work too). 7) Take 1 of the circles and place about 1 Tb of filling in circle. 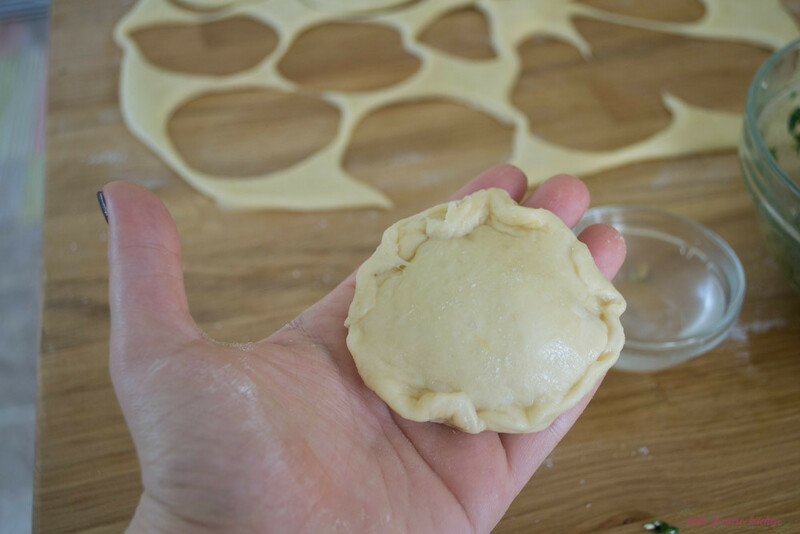 Then top with another dough circle, crimping or folding the edges, making sure there are no holes and it is sealed very well. You can also use some water to help seal the edges. When done, place on a baking sheet. 8)Bring oil to about 360-365 degrees F. A candy thermometer is highly recommended! 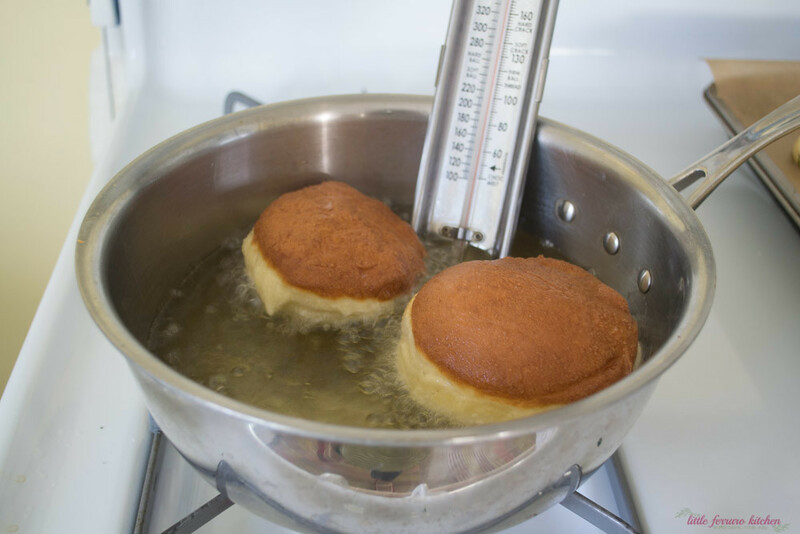 Once oil is hot enough, slowly place 2-3 sufganiyot in the hot oil. Fry one 1 side for about 2 minutes until golden brown and gently flip to the other side and fry for another 1-2 minutes until golden brown and puffed up. When done, place on a paper-towel lined baking sheet and sprinkle with salt. Serve immediately. 4 cups finely chopped Cut N Clean Greens Organic Rainbow Chard stems removed. First, make the dough. 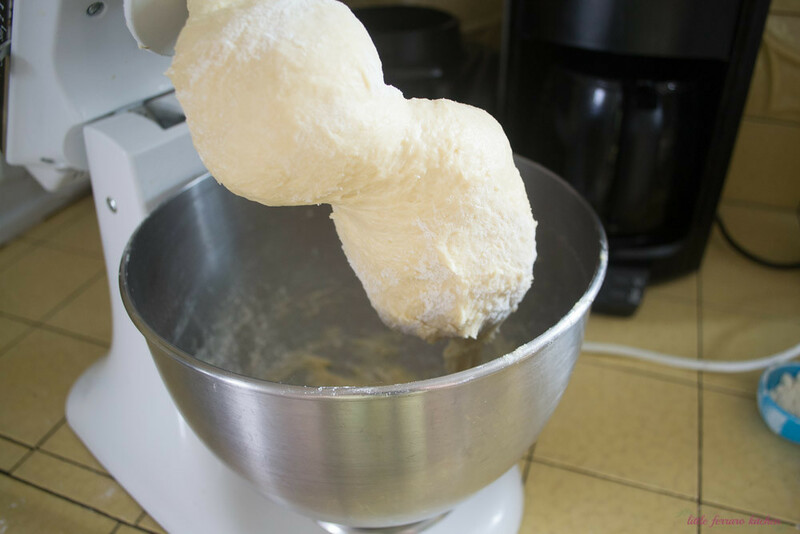 In the bowl of a stand mixer, add yeast, sugar and warm water. Mix with a fork to get all the yeast in the water and allow to sit for about 15 minutes until it gets all foamy and bubbly. That's when you know the yeast is activated. Next, in another bowl, sift together the flour and salt. Add eggs, lemon zest and gently mix the eggs into the flour. 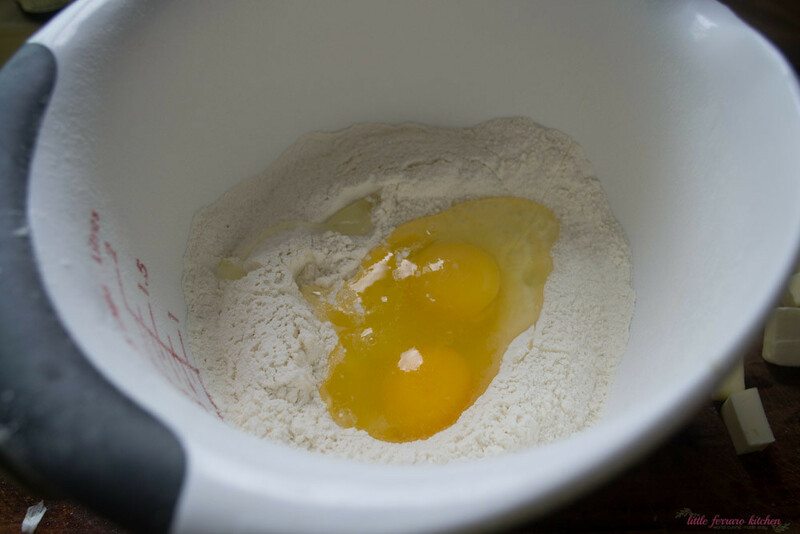 Add the flour and egg mixture to the yeast and use a dough hook to begin mixing everything together. You may have to use a spatula to push flour into the mixture, so check. Continue mixing for a few minutes until the dough comes together and starts to look smooth and forms a ball. Next, add butter, a few tablespoons at a time. If it's too sticky, add some more flour, up to 1/4 cup. It should look mostly smooth. At this point, I like to knead the dough my hand to see how it feels. Turn the dough on a lightly floured surface and knead by hand for a few minutes. I wound up adding 1/4 cup more of flour, slowly until it looked smooth and slightly sticky. When done, form the dough into a ball and place in a lightly oiled bowl. Cover with a towel and place in a warm spot to double in volume. While dough is rising, make the filling. Drizzle a bit of olive oil in a skillet and on medium heat saute onion until lightly browned, about 5-8 minutes. Then chop the rainbow chard into fine pieces and remove any large, hard stems. Add chopped chard and saute until wilted. Add raisins and season with salt and pepper. Saute for another minute until raisins plump up. Reserve to a bowl and add crumbled feta and toss to combine. Now check on the dough and once it's doubled in volume, punch it down and turn it onto a lightly floured surface. It will feel a bit oily and that's ok. Roll it out to 1/4 inch thickness and use a round 2 inch cookie cutter and cut circles (or any glass will work too). Take 1 of the circles and place about 1 Tb of filling in circle. Then top with another dough circle, crimping or folding the edges, making sure there are no holes and it is sealed very well. You can also use some water to help seal the edges. When done, place on a baking sheet. Bring oil to about 360-365 degrees F. A candy thermometer is highly recommended! Once oil is hot enough, slowly place 2-3 sufganiyot in the hot oil. Fry one 1 side for about 2 minutes until golden brown and gently flip to the other side and fry for another 1-2 minutes until golden brown and puffed up. When done, place on a paper-towel lined baking sheet and sprinkle with salt. Serve immediately. Recipe compensation and inspiration is from Cut N Clean Greens and all delicious opinions are always my own! Wow, I’ve had sufganiyot a couple of time but never made them myself. I love the idea of a savory inside. This is going to be a new classic!